Ahh … a whole week exploring Europe and never having to pack! Maybe it did cost us more to take a Rhine River Cruise than to see all the sights ourselves, but saving time and hassle of traffic and changing hotels? Priceless. When do you board a ship when you're going on a river cruise? Viking's instructions were to board in the afternoon so we spent our last Swiss morning packing. Before we checked out we decided to step out for lunch at a sushi restaurant nearby … but rats, the place was closed. 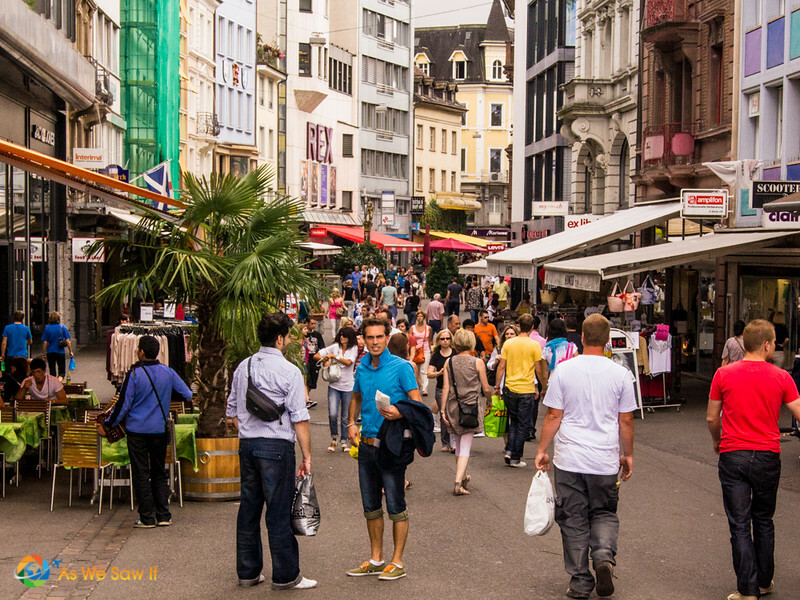 Tip: Remember that most shops in Basel are closed on Sundays. Be prepared. Streets are empty on Sundays. Fortunately, the Turkish sandwich shop across from the hotel was open so we each ordered a large doner wrap. Big mistake. The tortilla-like wrap they used had to be 16” around! It was so huge that with effort we could only eat half. Tip: Before you order, ask if your doner is large enough to share. You may wish to order a smaller size. Not wanting to drag our carry-ons through town, we hired a cab to the port. For a river vessel I was surprised at how long it was! It has three levels plus a full-length sun deck. We boarded the ship on the second floor, and registered. The concierge promised to have our bags brought up as soon as we were ready. In the meantime, all passengers were welcome to enjoy a light buffet upstairs. Later, there would be an optional jet lag buster” stroll into Basel’s city center, if we wished. Too excited about our upcoming cruise to go back on dry land, we decided to explore our new digs, beginning with a peek into the nearby dining room. Very nice – plenty of large windows would provide a panoramic view during our meals. What a relief to know that Viking doesn't have assigned seating. Climbing the stairs to the next floor brings you to a bright sitting area with a 24-hour station offering fresh fruits, assorted teas and a machine that makes hot chocolate and various coffees. That's handy! Plus, for those passengers who need online access but didn’t choose to bring their laptops, the area also has a small station with a couple of computers. More stairs tempted us to check out the sun deck on the “roof”. What do you think of the view? 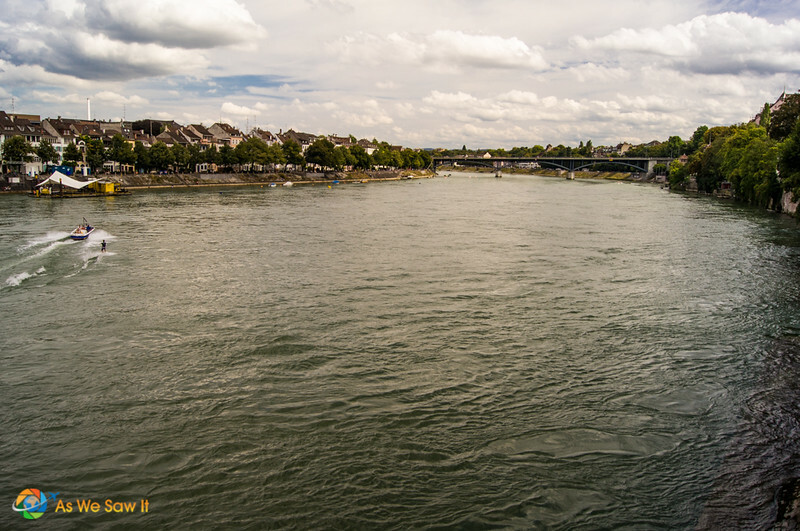 Nice view of the Rhine, don't you think? Just before cast-off, all passengers were called to the Sun Deck for the Safety Briefing. Life jackets required. Yep, even on the river people need to don life jackets for a safety drill. After dinner the cruise ship's lounge becomes a social area filled with people who want to relax and enjoy the live music. The Hungarian pianist, Istvan, is very talented and has a wide repertoire. Our cabin turned out to be only a few doors away from the lobby and dining room – quite convenient! It feels roomy, maybe because of its large window. We were happy to see that the window opens, perfect for a bit of fresh air or a photo up- or down-river. Early night because our next stop is Germany’s Black Forest and Colmar, in France’s Alsace region. Click on those links and read all about it!